12 races. 12 months. Run 'em all! Well, it is officially spring and we are one-quarter of the way through the 2019 series already. If you haven’t joined us for a race yet I encourage you to join us! 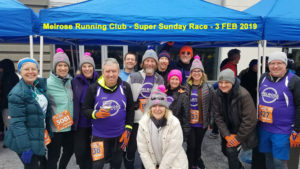 If you are new to the club this is a great way to try a race and hang out with your new friends! This year we are using a point system. I briefly described this in a previous post. Here are more details. There are 13 races again this year and each race is worth points. Maximum points for the racing series are 21 and you need to earn at least 16 to get a prize. If you start the series with the Not a Walk in The Park 5K in Saugus, you can get to 16 points. One reason I added points this year is so you can join the series later in the year and still be in the running for the prize. It also allows you to pick and choose which races you want to run to get to 16+ points. It can be done without running the Howling Wolf. 48 club members have run at least one race and I think that is the most runners ever for a year. Below is the race schedule. Some races have not posted dates yet, so there may be some changes. You can register for the races right from the Racing Series page. And let me know if you need a ride! 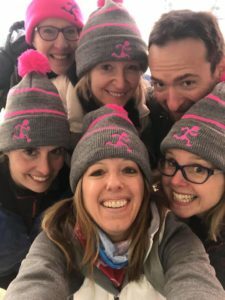 If you look at the Racing Series tab on the Melrose Running Club page, you will see that I have a schedule for 2019. Some races have not posted details and some of them may not. As such the list and dates may change. 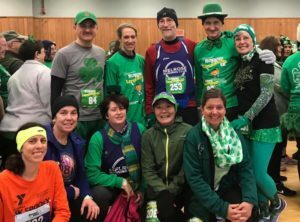 The Running of The Leprechauns just settled on March 17 in Medford this past week. They had problems getting a permit for the Malden Irish American Club. Towns are getting tighter with race permits. Cambridge has really flipped from being runner friendly to pushing races out of town. Malden seems to be picking up the slack, but it appears there is a limit to their racing endurance. 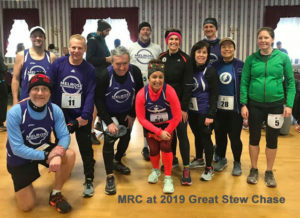 We had 22 runners at The Great Stew Chase and 31 at The Super Sunday Race event. For details on those races please click through to my blog. We also had three people volunteer at The Super Sunday race. Volunteers are crucial to the operation of any running event. Many of you know the challenges of managing our two club races. Volunteers make it happen. We had enough people on our team to qualify for a VIP tent which everyone seemed to enjoy. In the future we will try to get a team tent at any event that offers them. We do have a team for the Running of the Leprechauns. So far we are in second place and you know we can’t stand for that! Registration is still open so please join our team when you register, and earn your points. The post race event will be inside and I’m not sure about team tents or tables. As I mentioned above, the schedule is not written in stone. Several races still only list 2018 information. I’m sure that some of you are curious how you can win a jacket or another prize in the 2019 MRC Racing Series. In the past we counted each race as one point. Who ever ran the most races won. As people missed races or got started late they began to loose sight of the prize. We all know the real prize is running and good health, but I digress. The details are still being finalized but here are the basics. A 5K will count for 1 point. A 5 Miler, 10K or 15K will count for 2 points. The Howling Wolf Half will count for 5 points. Since the Howling Wolf is in October it will give people a chance to catch up and possibly win. So as you sign up for races, keep the prize in mind and choose wisely! I’m sure you have questions so let me know.